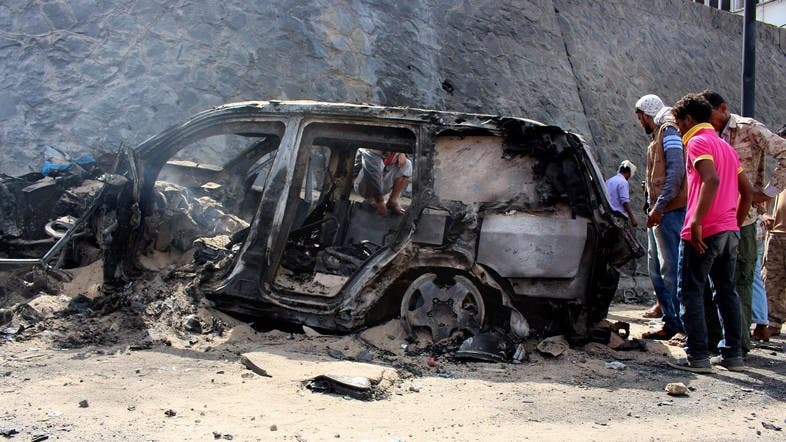 Four people were killed Wednesday when a car bomb exploded in the headquarters of the Ministry of Finance in downtown Aden, sources told Al Arabiya. The sources said that several houses surrounding the site of the bombing at the district of Khor Miksir were severely damaged, while ambulances were seen rushing to the scene. Severla injureis were also reported. Yemeni Prime Minister Ahmed Obaid Bin Dajar, on Tuesday met in Aden with Brig. Gen. Ahmed Abu Majid Commander of the Arab Coalition Forces in Yemen and Brig. Gen. Massoud Al Mazrouei Commander of the UAE Forces. During the meeting, Ben Dagher said that the government is continuing to fight terrorism, drying up its sources and chasing its elements wherever they may be. The Prime Minster commended the victories in Abyan and Shabwa provinces recently and condemned the terrorist acts carried out by al-Qaeda and ISIS cells in Yemen..